May 1975, Comic Strip Live opened its doors and premiered with legends in lights. 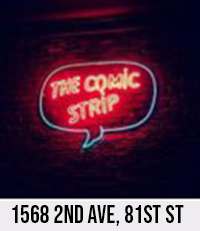 Comic Strip Live is the longest-running showcase comedy club in the world, let alone a Manhattan. Seven nights a week, the top comedians appearing across television and the silver screens take the microphone at Comic Strip Live. Comic Strip Live has been the home for many of the famous comedians such as Eddie Murphy, Chris Rock, Adam Sandler, Jerry Seinfeld and more. Comic Strip Live was voted AOL City Guide “Best Comedy Club” in NYC, Comic Strip Live features a light menu, full bar, and a beautiful showroom.